From Edward: Greetings! Sorry but I'll have to miss the gathering. Mary and I will be out of town celebrating our 33rd Wedding Anniversary. I continue in my ministry with Park Nicollet-Methodist Hospice in St. Louis Park, a program I've been with now since '79. Mary retired this past June after 35 years of teaching in the St. Paul Public Schools. We're childless by choice but are currently owned by our cat, Shadow. My sister, Judy ('69), and brother, David ('74), live in the Twin Cities, and my folks, (aka "Jim and Sal"), both 84 y/o, still live in their SLP home, despite our best efforts to move them to "assisted living". I enjoyed reading the updates. Best wishes to all of you! 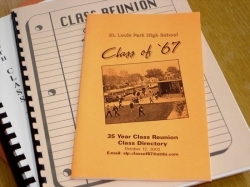 Thanks to all who were able to attend our 50th Class Reunion events. On a rainy Friday night, August 25th, much like our rainy Homecoming, about 175 of us visited with classmates and ate pizza at the Park Tavern. Then, on Saturday morning, the 26th, about 100 of us attended our Memorial Service at the high school. Beautiful music was provided by classmate Richard Siegel and the service was led by members of the Reunion Committee. A tour of Park High followed the service. On Saturday night about 250 of us attended the Main Event at the Marriott Hotel which included more visiting, lots of food and drink, more visiting, photos, a Silent Auction, door prizes, videos, music, and more visiting into the wee hours of the night which for many of us was about 11:30 PM! Stay tuned for future reunion plans and events. Your comments and suggestions are welcome. Again, thanks to all. From Susan: My husband Gerry and I are both retired and enjoying the "goof life". We travel a lot, play golf, volunteer, and enjoy our lake. We have been blessed with the ability and health to be able to do all this and more. Our kids live on opposite coasts, one in NYC and the other in San Diego so in addition to our "bucket list" of travels, we get to spend quality time in great places with them. Wow...50 years! We can't be that old! Can't wait to see everyone. From Sally: Hi! My first reunion in 40 years! As as musician--I see no retirement in the near future--but as long as I can still play, I'm happy to be working. I've lived in Cleveland (school), SF Bay Area, Guadalajara and Xalapa, Mexico, and Shreveport, LA, playing professionally all the while. I've been married to Tom, a French hornist/composer for 25 years and we have a son, 24, and a daughter, 21, and 2 cats. From Brent: My wife (Kathleen) of 41+ years and I live in Shoreview. Would you believe her high school mascot (from Argyle, WI) is also an Oriole? ...their school colors are orange and black and they use the same school "fight" song as ours! ...and they are also celebrating a 50th class reunion this year! We have 3 children and 5 grandkids. None of my kids followed in my footsteps as a Program/Budget Analyst--- ha! They all went very different directions. My daughter is an art teacher, one son a nuclear radiologist and the youngest son , a construction engineer. I am retired from a 30-year career with the MN National Guard and also retired from a 36-year career with the Corps of Engineers. I am enjoying retirement--- traveling, having fun with the grandkids and family, golfing, attending sporting events with fellow classmates and just plain relaxing-- reading a good book, drinking a glass of wine by the beach and doing what I want to do whenever! I have strong ties to the U of M, having graduated from there and with a son graduating from Med School there... it has made me a devout Gopher sports fan--- although I must say ----it has been "tough" at times! Looking forward to seeing old friends and catching up. From Cindy: My husband Mike Kalland (Benilde'65) and I live in Minnetonka where our daughters (Shana, 25, and Julia, 21) occasionally live. I just retired this spring from teaching after 36 years. I taught English at Hopkins High School and, most recently, was a Master Teacher for the school district's Q-Comp program. I'm not sure what I'll be doing-- exploring my options, going out to lunch, traveling, and reading more books are my only certain plans. Had a blast last year at the all-Parkette reunion. I'm looking forward to seeing everyone. From Thomas (Tom): After 20+ yrears in nedicine, went on to second career in Ministry / Pastoral Care. Just retired in Spring '06 from St. Mark's Episcopal Cathedral in dwntn Mpls. Enjoying an active retirement... (Somehow, it's really just more work and less pay) Continuing my passion / ministry for welcome and inclusion of marginalized folks.. Recently wrote a cookbook, - a best seller at St. Mark's Bookstore (all procedes going to Outreach Ministries. My life is enriched with each breath, as God continues to provide unexpected surprises and wonderful "Aha!" experiences. From Mallorie (Lorrie): We just moved back to CO.from AZ. with our 2 dogs and our horse. We have been married for 38 years.Our daughter just had a baby in Dec. which is our first grandchild. They live in MN. so we get back often. Most of our family is still there also. My hobbies are showing my dogs and painting. Hard to believe that 40 years have gone by. Having been an architect for a while, a missionary for a while and a pastor for 30 years I finally slid into something called retirement that I am still figuring out. While I do so I read a lot, golf a lot, and love to travel on extended road trips. By the time we get together I will have completed my trip along old Route 66. I have discovered an interest in the history and culture that makes different places unique. And art museums. Love art museums. My wife Barb and I have two daughters, one married and the other getting married this summer in Zurich where her fiance hails from. Last year we also became grandparents for the first (and not only, I hope) time. My intention is to make the reunion. From Cathy: I am planning to attend the reunion and look forward to seeing many of you there. I have lived in Oregon since 1975 with my husband of 34 years, Stan. Our 2 wonderful children are both engaged - son Patrick will marry this October followed by sister Jennifer next July. So we're just starting the road many of you have already traveled. I worked as a School Psychologist for 22 years and I have been a district Special Education Administrator for the past 10 years. My other career is school safety. After being closely involved with our district recovery following a fatal shooting at a district high school in 1998, I have worked at the state and national level in crisis planning and response. I have provided crisis support following school shootings in districts such as Littleton, CO; San Diego, CA; Cold Spring, MN; and Cazenovia, WI. Last fall I was privileged to be an invited participant in the White House School Safety Conference -- politics aside, it's pretty cool to meet and "chat" with the President and First Lady! I am blessed with work I love and a fantastic family. My husband of 37 years and I enjoy living on a lake near Annadale,Mn for the past 4 years. We have 3 active grandchildren who come to play often. I spend my summers gardening,reading, and swimming with the grandkids. I am an avid Twins fan and follow all Gopher sports. I work part-time for a financial consultant. Walking is an everyday must. Life has been good. Where did 40 years go? From Diann: When I reflect on my years in the St. Louis Park school system, I appreciate the fact that besides an education, I received a lifelong realization of the need for tolerance and diversity. During a Junior High student election, I heard Cynthia Mayeda deliver a speech on the Japanese internment camps from the 1940s. I was shocked as I learned that this occurred in the USA. More shocks over our history of intolerance were to come, but this was my first remembered exposure to the need for tolerance. The second came from just living in SLP. How many times did we all hear someone say “St. Jewish Park” without regard to its implication of anti-Semitism? In attending SLP, we were schooled early on in the need for tolerance and diversity. I’m grateful for having attended a school where these values were an everyday experience.